This is based on my monthly column in the WestView News, a paper that serves as the voice of the West Village. 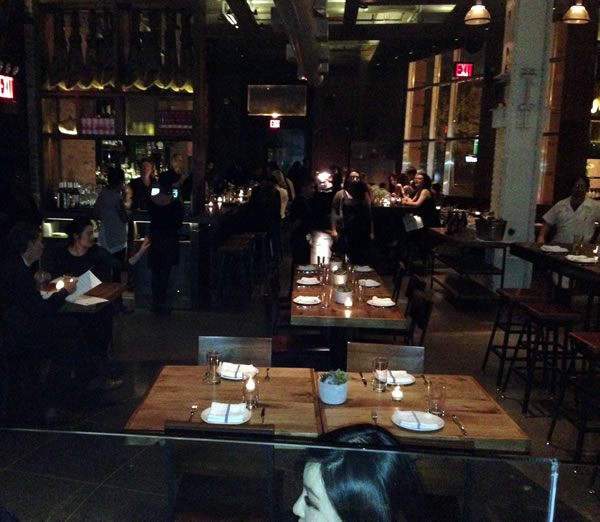 In this piece I review the new restaurant Toro (85 10th Avenue, www.toro-nyc.com) that just opened and is a few steps away from our store in Chelsea Market. The new restaurant season is upon us and as a keen enthusiast, it is most exciting to read about all the new places opening or about to open. Traditionally, if you are going to open a restaurant, September and October are the best times so that the kinks can be worked out. Accordingly, when December comes round, everything is working and in high season, you can make some money and help pay for the extensive cost of opening a place in Manhattan or the West Village. Whether New York Magazine Grub Street, The New York Times Food Section, Time Out Previews, there is lots of publicity about all the new happening which start the frenzy, necessary to be successful in the city. A restaurant that has gotten a bit of this and was one of the earlier ones to open is Toro on West 15th Street and the West Side Highway. I dined there on the very first day it was open, this past Saturday. Toro is a very successful restaurant in South Boston. It is almost 10 years old and is owned by Ken Oringer and his chef partner Jamie Bissonnette. They also own five or so other restaurants in Boston and one in Maine. Additionally, they are also the organization behind Willow Road, a restaurant sandwiched between Colicchio and Sons, and Del Posto in the same building but on the Tenth Avenue side. In any case, Willow Road was their first stab into the big apple and now that that that has grown a bit, they are going big time with Toro. Built in a space that has been vacant for about as long as I can remember and a somewhat desolate corner until recently, Toro is a pretty restaurant that has high ceilings and has windows that look out on to the West Side Highway and Pier 57. A theme of many new restaurants opening in Manhattan is that they come from successful businesses outside of New York and are now ready to make it in the city. Another theme has been Tapas, and Latin inspired foods, which up until a few years ago had not been well represented, small plates along with the flexibility to spend less or more, likely more and with some food travel adventure about it. I am happy to say that Toro performs well as an exciting small plate restaurant which takes you on a culinary journey. Beyond that, the menu is broken up into Cold Tapas and Jamones – Ham, Warm Tapas, Grilled (a la Plancha) Tapas and Paella. We sat at the Plancha-grill station which is raised from the floor of the restaurant and provides the entertainment of watching the food being prepared. The two working at this station were pleasant to speak with and shared a bit of insight about the food on the very first day. Sitting here also, if there are just two of you, makes for a bit quieter experience than being in the din of the dining room that has a sizable bar, and although not too busy on their unannounced first Saturday night in business, I am sure that the place will get to be raucous during dining rush hour. We treated ourselves to a half order (which we were accommodated on and the full order being $36) of Iberico ham “De Fermin,” which lived up to its reputation of being one of the most precious foods, its subtle, nutty, nuanced flavors did not go unnoticed. The highpoint of our dinner was the Paella De Conejo Y Lumach or rabbit and snail paella, we had the smaller plate ($30), but it is also available in a larger size as well. 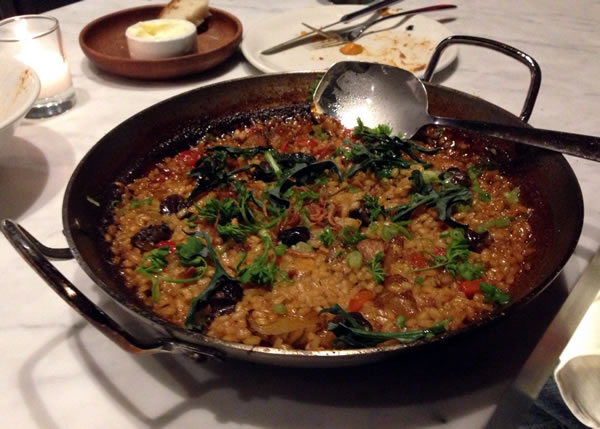 The paella dish was freshly cooked with a very rich and moist flavor and texture and was a standout amongst paellas I have tried. The crusty and caramelized sides and bottom were enjoyable but could have been enhanced slightly with a marginally different oven experience. Yes, it was the first night and it was great; enough for two to share as part of a tasting meal. We also tried the grilled corn with aioli, lime, espelette pepper and cheese. This was good. I would say it could have been better with a little less aioli and more lime. There were just two choices for dessert, churros – fried dough with chocolate sauce or a not easily described dessert that in fact was goat’s milk yogurt mousse with licorice caramel along with heirloom apples and fennel, beautiful to look at, and interesting to taste, it scored well. I would have liked more variation on the texture, something crisper involved; the apples were too finely cut to play that side of the continuum. Toro helps expand this neighborhood and the available dining options, and with a high-octane menu. 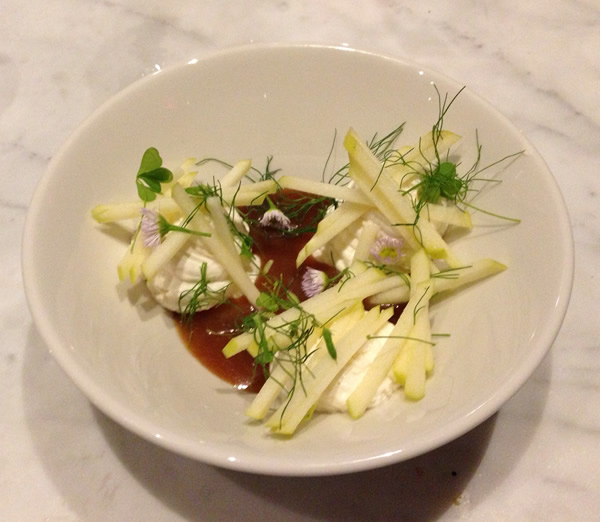 The restaurant has a casual bar oriented feel but a menu that is ambitious and original and will likely evolve. Toro is an example of how the restaurant business has gotten even more competitive with quality dining options, challenging competing business to keep on their toes, and fighting the bulls.